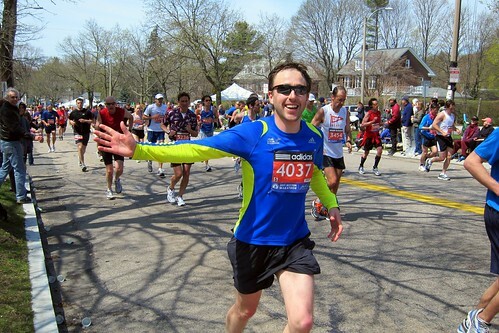 In Boston, every year on the third Monday in April, Patriots’ Day and the Boston Marathon collide. 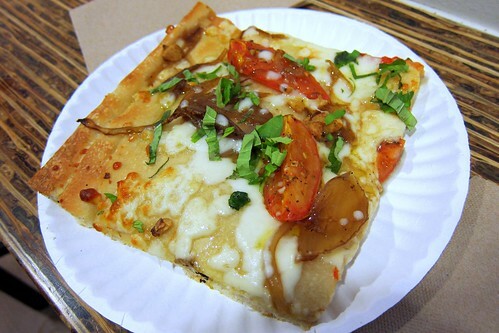 Bostonians choose to spend this day in different ways. Some will pound the pavement in deep, focussed concentration with the hope of achieving ultimate glory. While others get insanely drunk and take to the streets in celebration. With my sign and ready to cheer! 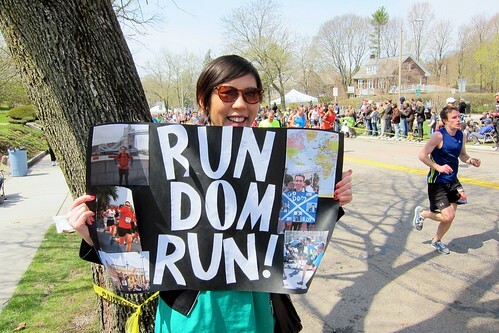 My day was all about cheering on the marathon-running-marvel that is my friend Dom (the main reason for us taking this holiday to Boston), interspersed with a number of foodcentric moments. 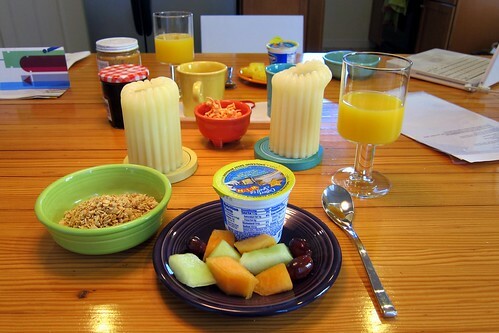 We started off with a relatively healthy breakfast of cereal, fruit and yoghurt at our nifty apartment that we rented through Airbnb. It was my first experience using such a site for booking accommodation in people’s homes, so I was quite pleased with the results. Our lovely host had left a tonne of food for us including all the ice cream we could eat and a couple of bottles of wine! We then journeyed to Heartbreak Hill, the final hill towards the end of the marathon, notorious for destroying many a runner’s dreams. Here we got down amongst all the college kids (some clearly more inebriated than others), enthusiastically cheering on the runners and snacking on a less than healthy slice of pizza to give us plenty of energy for cheering. 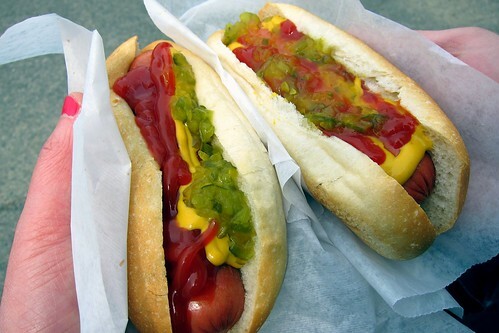 After we’d finished watching the Marathon, we headed to Boston Common where we grabbed further snacks in the form of a couple of hot dogs from a nearby ice cream van. The snacking didn’t end there… some tasty bready treats from 101 Bakery in Chinatown were also collected and consumed in Boston Common. 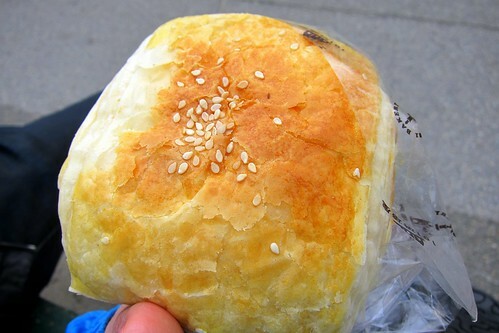 I love asian style bread… sweet, buttery, soft, squishy. 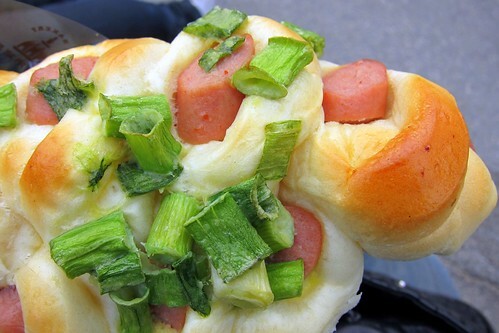 These did not disappoint, although I felt the hot dog and scallion bun could have done with the use of a more flavoursome hot dog. We later met up with our friends at the Top of the Hub – the restaurant and bar at the top of the Prudential Tower, for some traditional post marathon celebratory champagne. 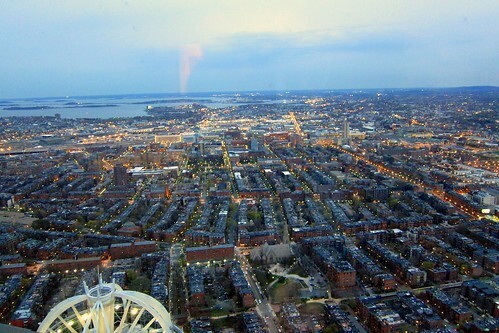 We got a great window seat and it was lovely to see stunning views of the sun setting over Boston. 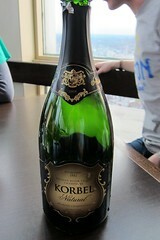 We then had dinner a few floors down at Legal Sea Foods. It was a big restaurant and was hustling and bustling when we arrived but eventually emptied out. 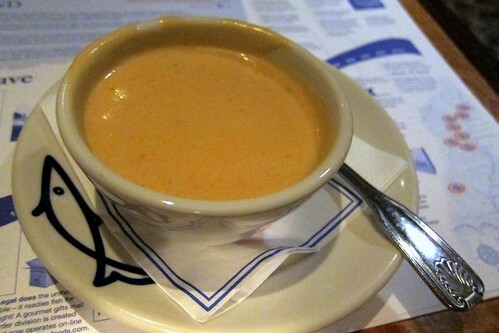 We started with some soup, the famous New England Clam Chowder and Lobster Bisque. Being a chain restaurant I wasn’t expecting fine dining standards, but it was enjoyable enough. 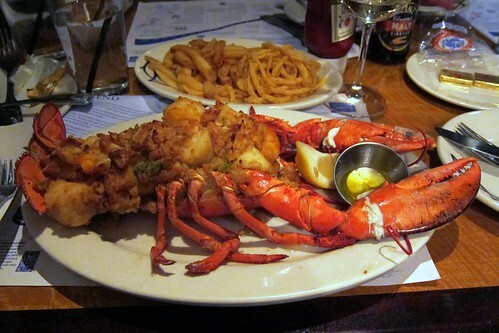 And the onto the main event… being in New England I of course had to order the lobster! 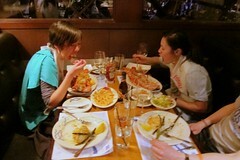 Despite going for the smallest option, the baked lobster that arrived was still a massive, hulking, beast of a dish. And what’s more, dripping with a artery clogging topping of of scallops, prawn, crabmeat and ritz crackers… all drenched in butter! 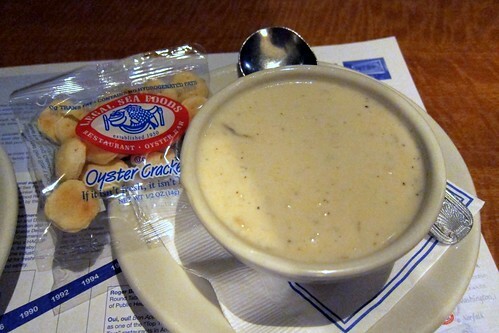 I must say I was a little horrified at the sight of all that butter, and it wasn’t the best lobster dish I’d ever eaten; I wasn’t a fan of the soggy crackers and the seafood was slightly overcooked. But I did enjoy digging down to the sweet lobster meat itself, sucking out every last precious morsel. 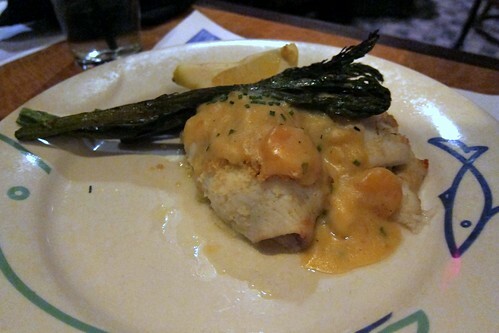 The daily special of skate (I think it was), prawns and grilled asparagus in a lobster sauce wasn’t the biggest hit and looked slightly disappointing next to the lobster dish. The fish was merely OK and the asparagus had a slightly burnt taste. 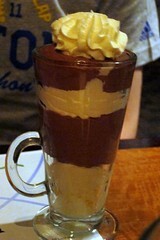 It was a bit of a shame as when our waiter described it, he made it sound amazing! Sign of a good salesman I guess! Then onto the desserts, which fared slightly better. 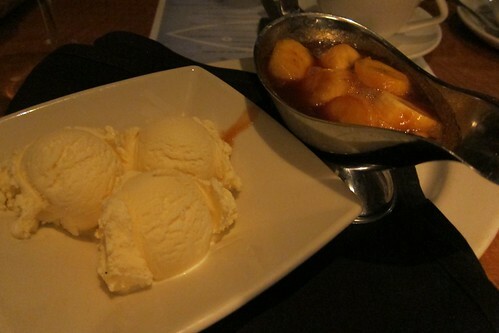 I really enjoyed the bananas foster: sauteed bananas in a hot caramel and rum sauce served with ice cream. 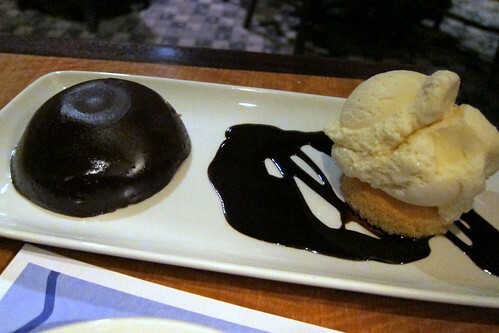 The warm chocolate pudding was also deliciously chocolatey and gooey. Service was friendly and ultimately I found Legal Sea Foods to be pleasant enough, if not a little on the touristy side. Either way, we were in the mood for celebrations and so had a really enjoyable evening regardless of how we felt about the food. And for the record, Dom did an amazing job in the marathon. Check him out on Heartbreak Hill… while everyone else around him looks like they’re dying, he doesn’t even seem to have broken a sweat!